Maximum size: about 5 mm. 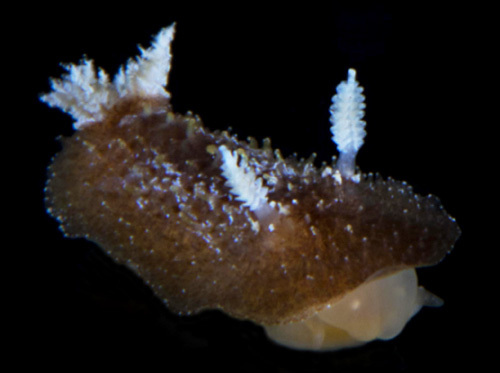 Identification: This is a dark, greenish-brown species with white branchia and rhinophores. The notum has elongate papillae with lighter tips (yellowish near the center). Natural history: The one known Thordisa cf. oliva was found under a rock in a tide pool at a depth of < 1 m (< 3 ft). Distribution: Big Island: may be widely distributed in the Indo-Pacific. Taxonomic notes: It was first recorded in Hawaii from Ho'ona bay, Big Island by Paul Okumura on Oct. 21, 2015. This animal appears to be a close match for some Thordisa oliva photos but seems to have somewhat more slender papillae than most. Photo: Paul Okumura: about 5 mm: Ho'ona bay, Big Island, Oct. 21, 2015.